Picture this social emergency: You've invited your best friends up to your vacation home (situated on your $12 million private island), only to realize that there aren't enough beds and rooms for everyone. The solution: Spend just under $100,000, and have an 8-foot, 7-inch square home delivered to your backyard by helicopter. Okay, so maybe this "solution" is outside the reach of all but the uber-rich. Still, each bizarre home comes surprisingly well-equipped — so much so that you might be able to justify the purchase regardless. You get two double compact beds, a sliding table to accommodate up to five people, a kitchen area with microwave and refrigerator/freezer, a flat-screen television, and even a thermostat-controlled heating and air conditioning system for your money. You also get a pair of solar panels to power it all. Scoring your own micro-compact home won't actually break the bank. 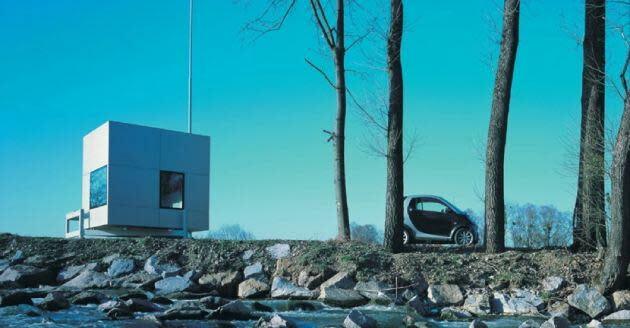 According to micro compact home, the designers and purveyors of these Japanese-inspired homes, prices start as low as 38,000 euros (about $47,700). If you do choose to order one, delivery can be completed by helicopter, and installation takes approximately four minutes. It's one of the most expensive kinds of instant gratification available, provided you're excited and gratified by living in a tiny, space-aged cubic home.